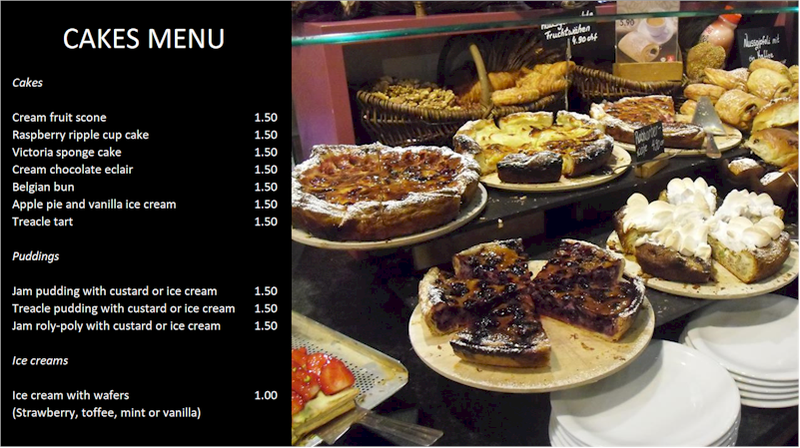 "Our clients like Repeat Signage software and find it easy to use". DockCom IT Services, Australia. The Repeat Software team will give you an outstanding level of support with free training videos and we have satisfied customers in over 30 countries. We work with global distributors and reseller partners in the AV, IT, graphic design and software sectors. Repeat Signage Standard edition digital signage software is designed for schools, colleges, hospitals, retail, hospitality, businesses and larger organizations that need to update schedules and presentations remotely. User-friendly, after downloading Repeat Signage digital signage software onto your Windows computer, you can create a presentation in minutes. Simply insert your logo, pictures, text, date, time, RSS news feeds or scrolling text, spreadsheets, PDFs, audio and other media, and move it around the screen to create your presentation. Connect to any display screen, small or large, landscape or portrait, to promote your own activities. Supports touch screens. Includes scheduling of presentations. Repeat Signage Standard edition includes a scheduler for controlling when presentations of pictures, text, videos, documents, etc., are played (hourly, daily or weekly), and you can update content from your network drive, from a website or over the Internet, with no on-going costs. Repeat Signage Standard also has a webcam, built-in spreadsheet and PowerPoint presentation scheduler. There are 10 Flash clock designs, 2 Flash RSS designs with easy RSS feed creator, page-turning PDF control for displaying brochures and built-in spreadsheet grid. Unicode support for display country characters. See full list of features. No details required. No commitment. Our clients can create a free www.repeatserver.com account, fully integrated within Repeat Signage software, that allows the creation and hosting of RSS feeds and to update your files over the Internet, free of charge. The Repeat Software team will give you an outstanding level of support with free online training videos, sample presentations, 4000+ icons to enhance your presentations and email technical support. We have satisfied customers in over 30 countries. Repeat Signage Standard licence price is a one-off payment for each Windows computer playing presentations onto one display screen. Remote updating of presentations over the Internet is a free service, integrated within Repeat Signage Standard edition digital signage software. Repeat Signage is in use in a diverse range of businesses. It is used in factory production environments, airports, power stations, publishers, shops and restaurants around the world. Repeat Signage is also in schools, colleges and universities in the UK, US, Philippines and Australia, and US and UK NHS hospitals. "From a technical perspective, DockCom Technology Services, as an integration and signage installation specialist, find Repeat Signage software an excellent choice of reliable software with an extensive feature range, suitable for many applications. Most importantly, we find that clients like the software and find it easy to use". 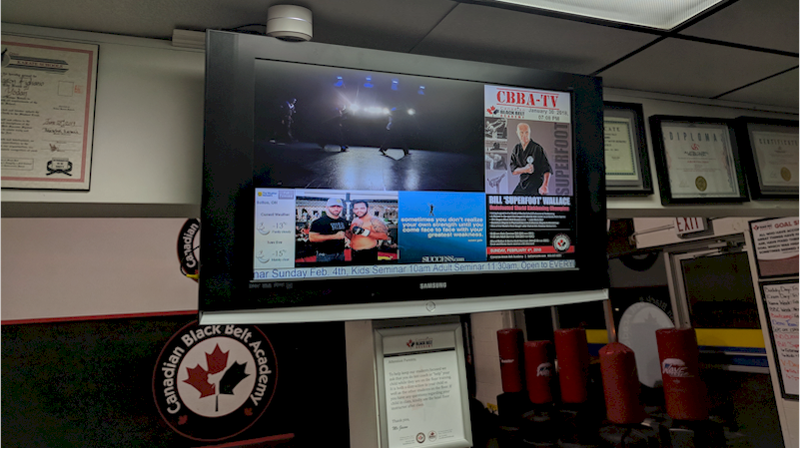 "For the last 5 years I have been looking for a simple to use option for digital signage that would work in our Martial Arts Academy for the parents to watch while classes are running. Repeat Signage allows me to advertise to clients, connect to rss feeds and create better branding without paying a monthly fee and having to eat up your internet bandwidth. The staff are great to deal with and respond to your questions fast. Having used it for a month now we have had no issues and have had more students register for events at a faster rate without having to seek them out".